Powerful, truth filled post!! !1 Love it. Never thought about free-falling into His arms, great visual. Thank you so much for always encouraging us. Oh, thank you for your precious visit and encouragement, Noreen! It is such a blessing when you stop by. I trust the dear Lord will bless you abundantly, in return! Many hugs back to you today! Hi Cheryl! I will continue to pray for LD and your family. You and I are definitely the shameful duo when it comes to fear and worry. Like you, I know all the verses and the Truth and I believe God can, I just have trouble trusting. Funny isn't, I can trust Him for saving my soul but doubt Him with daily life down here? A few weeks ago, I started meditating on I John 4:18 ... Perfect love casteth out fear. So God is love, He is perfect, His Holy Spirit dwells in me. He commands us over and over to fear not. It just really started hitting me how much I was not only grieving the Holy Spirit, I am sinning and causing problems in my relationship with the Lord.Now when I start to worry, or fear try to creeps up on me, I immediately pray and ask the Lord to help me cast down that imagination just as I would if I stared to grumble in my mind about a chore I had to do and asked God's forgiveness for and help with a better attitude. So far, its been better! Thanks for this post, I'm sure we're not the only ones! I'm so sorry about the report on LD. What a truly trying and fearful time. I can so relate to your post as I too am a WW :) Now even though I "know" that worry solves nothing and contributes to so many more problems, I still struggle. I think though that I DO see progress (albeit SLOW) in this area and I think that's just fine. As long as there is 'forward movement'. Also, reflecting on how God has been merciful and faithful through the years helps when that worry creeps in. So maybe AGE has a benefit there??? "There is no parachute during a free fall into the arms of God. especially paired with that verse from Deuteronomy 33 is speaking so much to me today. I can hear Elisabeth Elliot quoting that day after day, when we were in the midst of hard days years ago. And to be reminded of that now is such an encouragement! He is our only safe refuge! May He continue to hold you up, and so close to His heart, my friend. You and your dear family are daily in my prayers! Love & Hugs! Dear Bettie! Thank you so much for your understanding heart and sweet encouragement! Oh, that is so precious about how Elisabeth Elliot quoted that to you during your hard times. She surely was a precious soul and is so missed. I love that verse dearly, and it has sustained me through many places in life. Your prayers and friendship and support mean the world to us. Sending much love and many hugs back to you! Praying for LD and the family. Sorry to hear your in the "valley". We've all been there, been in it relying too much on our senses and not relying on the One who's seeing us through it. "Fear of the Lord is the beginning of wisdom." We all fear, or revere, this world sometimes more than we revere He who holds it in His hands. Seems silly upon contemplation, but that's why we turn to Him for wisdom and comfort. Thank you so much for your prayers for LD and our family, Floyd. We are so very grateful to you for your faithfulness and encouragement. God bless you abundantly today! All I know about fear, that’s what worry is, is that perfect love casts it out. The love of God comes to us. We don’t go get it or earn it or pull it onto ourselves like a blanket. It just comes to us. Praying for that for you now. It’s nothing you do. My dearest Cheryl. You write the words that God has not gifted me with the ability to write. I too, have been called a WW all of my life. Anyone who knows me at all knows that I am world-class worrier. And I, like you, are ashamed of the fact. Thank you for these words for me to read over and over again. I have been in prayer for LG and his family and will continue to do so. Thank you for the update so I know more specifically what to pray for. You describe that battle with ugly fear very well. And then we end up realizing so much that torments is a smoke screen. Let's hold on to Jesus and His promises because you're right--He is always faithful. Praying for the family, for LD to feel Jesus' love and strength right now. Loving hugs to you, Cheryl. Thank you so much for your dear prayers, my friend. They are carrying my family through this latest crisis. Sending many hugs back to you, sweet Mary. God bless you! Oh, dear friend! It sounds like you and I have so much in common. I know what you mean, I was just praying so hard earlier today, begging my dear Lord to forgive my lack of trust in Him. Your words are so precious to me, and your visits always encourage my heart. You will never know how much we appreciate your faithful prayers, love, friendship, and support. I trust God is blessing you and you are looking forward to your time with your family this Thanksgiving! Sending hugs to you! Oh Cheryl, I'm smiling because so much of what you write is how I feel, too. We are only humans, but we want to control things, don't we? Yes, trusting is so very hard for us, and it's a lifelong journey. I'm sure Our Heavenly Father just shakes His head at us. I'm a WW, too, and I guess we just can't help it, for it is what makes us who we are. I'm so sorry about LD, and I'll continue to pray for him, and you and your family. Love and blessings to a fellow WW! Oh, yes, dear friend, we surely do want to control things. And, when we can't, it causes great frustration and alarm. It is so wonderful to know that I am not alone and in such great company. We could start our own support group called, "WW Anonymous"!!!! We could come forward one at a time, give our name, and take that first vital step in admitting we are a full-fledged worry wart!! LOL! I guess maybe that is what we have all already been doing here, and maybe just admitting we need help truly is the first step in our "recovery" journey! Your prayers for LD and our family are so appreciated, and I am so grateful to you for your faithful support and friendship. Sending much love, many hugs, and lots of blessings to you, my sweet fellow WW!! Oh, precious Cheryl, know that I am praying for LD! I know God has a plan, and it's the hardest thing to just rest in knowing that. And, yes, we tend to all be WW, and yet God knows that and loves us still. I always try to remind myself that God cannot love me more nor love me less no matter what happens. He has me in the palm of His hand...praise God for that! We are in a lifelong journey as each of His children are being formed more and more into His image. Praise God we shall be glorified some day and with Him forever. Till then, we read His Word and wait on the Holy Spirit to guide us each and every moment! Hugs and love, precious one! Yes, dear, precious friend! One day our worries will be over, because none of us will be able to find one, single thing to worry about!!!!! Can you imagine? Knowing me, I will be fidgeting around, scratching my head, wondering why I am so at peace and feeling like I should be upset or worrying about SOMEthing! Thank you for your sweet visit, and oh, my, we SO appreciate your prayers for LD. 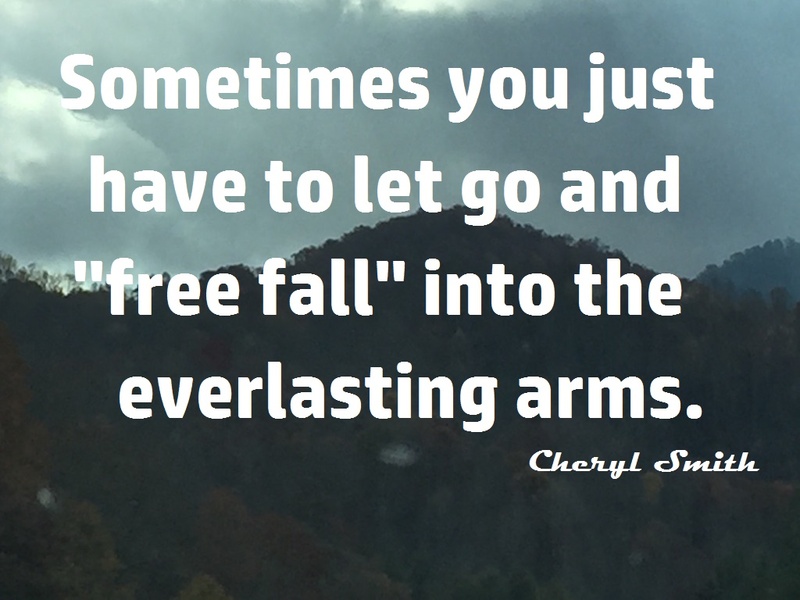 God bless you abundantly, sweet Cheryl! Girl, you wrote this post for me. I am such a WW too! I always seem to think the worst, and then just seethe over the situation. I'm SO sorry about your ulcer...I have stomach problems too. How can I doubt my Lord like I do? It seems so silly, and he always tells me that everything is okay, and I don't need to worry. My goodness, if I need confirmation about that, a quick look at Scripture would tell me the same thing. I am praying for LD, and I'll pray for you too. God hold you all in his tender hand, and bring you to peace and healing in the name of Jesus. Amen. Oh, how sweet it is to know we are in this thing together, my friend! I know exactly what you mean...my mind can have someone dead and buried and already be grieving when I haven't heard from them by a certain time, etc. It is so ridiculous, and the dear Lord must stand up there looking down in such total frustration withe me. I am so sorry you have stomach issues....whew, they can really wreak havoc on your life, can't they? The suffering has been horrible, at times, but God is there through it all. Thank you from the bottom of my heart for your faithful prayers and friendship. I am so thankful for you! "When Hitler began bombing the city of London with his air force, the English moved trainloads of children out to the country for safety. One little youngster was asked, “Where are you going?” The child responded, “I don’t know, but the king knows.” I don’t know where I’m going from here, but my King knows. In the midst of it all, King Jesus knows where you are going from here. Even though you have hurt like never before, He is there, and He “knows." Oh, Beth! That is AMAZING!!! And, I LOVE the story you shared...you are such a dear blessing and encouragement to me, time after time, and yes, it is just something how the Holy Spirit knits our kindred spirits together. Your prayers, support, encouragement, and friendship are invaluable gifts, and I am eternally grateful to have you in my life. Sending much love and gratitude to you today! Oh dear Cheryl! You have written such powerful words! Truly the greatest weapon of the enemy is fear, which he uses in a myriad of fashions, shapes and sizes to distract us, and cause great destruction in our lives. So many times I have recognized fear in every situation that gives us distress. It is fear that paralyzes us that he brings, and how wonderful to know that the fear of the Lord is different, because it made both David and Peter bold, even in their weaknesses. The enemy seeks to paralyze us with his fear, but the Lord wants to empower us with our fear and love for HIM. I pray that the POWER of the Lord comes from on high, breaks down the barriers that fear from the enemy has erected, and that the chains of fear and worry are broken in your heart, mind and life! Yes, I will believe with you that this go-round with fear has met its Waterloo and that the Lord will empower you to strike back at the heart of the enemy's tactics with your trust in Him. David slew Goliath, and Peter was victorious in ministry, their faith prevailed, and God did mighty things through them, and such will be for you dear friend! I too am praying for LD that the mighty hand of the LORD will prevail in his life, and bring about a miracle of healing for him. Continuing to pray for the family too! Appreciate you so much, and how you write about topics that touch our hearts deeply, and praying for the Lord to continue to empower you with His spirit to overcome the tactics of the enemy of our soul, in Jesus name! Oh, sweet friend! I LOVE everything you shared here...how it blessed my heart today! I love how David and Peter overcame and became bold and such mighty warriors in the service of the Lord. You are so right that fear is paralyzing, and it can become such a stronghold. But, praise God, He can tear those strongholds down and give us sweet victory and relief! Thank you so much for praying for LD...oh, we do appreciate those prayers from the bottom of our hearts. Your words of encouragement here and emails and phone calls are precious gifts to my life, and I love and appreciate you so much! I will email you as soon as I can. Hi Cheryl, you dear friend! It's Su Ann. I continue to pray for LD and you and your family. Yes, fear(doesn't deserve capital letters) is working hard here, too. Ugh! You are so right...it does NOT deserve capital letters! I am so sorry you are in the battle with this grim monster. I pray for you often, sweet friend. Thank you ever so much for your precious visit and kind words. God bless you and keep you and encourage your dear heart! Well written, raw, true to the core post! Thanks for sharing it and for your open heart. Thank you ever so much, AnnMarie! Your visit and kind words are such a dear blessing, my friend. :) God bless you! Thank you for your visit, Nancy, and for the thoughts you have shared. I appreciate it so much! John 16:33 is one of my favorite verses and has comforted me so many times through trials. The trials are surely appointed to us, and, you are so right, it is such a comfort that our dear Lord has already walked ahead of us and has already overcame the world! Thank you ever so much for your prayers....they are so appreciated! God bless you, my friend! Oh sweet friend did I need to read this!! We are even more kindred than I realized!! But I'm not surprised. Most especially the refrain convicted and encouraged me. Thank you for sharing your precious heart so transparently. You have encouraged me beyond measure. I'm so sorry to hear about your brother-in-law and will continue to pray. Oh, sweet friend! I just soak up your words like a sponge! Yes, we truly are kindred spirits. This Thanksgiving season, I am so thankful for you and your presence in my life. I LOVE this song, too! I can't tell you how many times I have sat and listened to it, and the words just resonate deep each time I hear it. Thank you for sharing the words with us here...oh, it just meant so much to me today! You will never know how much we appreciate your continued prayers for LD. You are such a precious blessing to my family and me, and I love and appreciate you dearly. God bless you today and during this Thanksgiving season! You share and write so incredibly well. Your faith is deep to your core. You have nothing to fear but fear itself. Smile ruefully and lay it all at the feet of our Lord and Savior at the Cross. I always have this image when I am truly "letting go and Letting God." I envision the actual laying of the problem/concern/fear/worry/stress at His Bleeding Feet. It lifts it off my shoulders like nothing else I know. We cannot have you get ulcers. Too many need you. Including your readers. Take care, and fear not. We know who wins the battle in that ring, don't we? With God on our side, we have nothing to fret. Dear, sweet Michele! THANK YOU from the bottom of my heart for your dear words! Oh, they truly meant so much to me today! I love the picture of laying my burdens at Jesus' bleeding, nail-scarred feet! You are such a dear blessing to me, and I cannot thank you enough for your dear comments and encouragement. Sending love and hugs to you this Thanksgiving season, sweet friend! God bless you!!! Oh, dear BJ! I am SO sorry, sweet friend! I know your heart is so broken, and the "firsts" will be the worst of all. This first Thanksgiving, Christmas, etc., will be so hard, and my heart just breaks for you. I am praying for you and sending much love to you today. Trust in His everlasting arms to hold you, my friend. Love you. Thank you so much, dear Lyli. Sending hugs and gratitude back to you! Will be praying for LD. May God bless and be with you, Cheryl! There are a lot of good things in Psalm 118 including my confession from the beginning of my cancer fight. I will live and not die and declare the goodness of the LORD in the land of the living. I plead the blood of Jesus over LD for miraculous healing and that he will live and not die and declare the goodness of the LORD in the land of the living. Psalm 118 is one of my favorite passages, too...SO precious and dear to my heart. When I sent a bunch of Scriptures to my sister to read to LD the other night, the one you quoted here was one that I included...it has been so close to my heart so many times in my own physical afflictions. Our words hold so much weight! I also sent them the book "God's Creative Power" by Charles Capps. If you have never read it, you would really enjoy it. He talks a lot about healing in it and has one whole chapter that I try to quote as often as I can. Thank God for His Word and the power it infuses into our lives! Thank you ever so much for your prayers for LD. We appreciate it from the bottom of our hearts! Sending hugs back to you and many prayers for your continued healing and restoration, Laura. You know, Cheryl, I think that one aspect about you that is a lot like David is the heart you have to follow hard after the King. :) That was the prayer God gave my for my son when I was pregnant with him, that he would be a man after God's heart like David, and love him in worship and praise. He is a gifted pianist today who spills out his heart on the piano. I appreciate your transparent heart. Thanks for sharing this at the #GraceMoments link up.